Discover the world of George Nakashima, Bucks County’s internationally known master woodworker (1905-1990) and his contemporaries. The Michener’s Nakashima Resource Kit is an interdisciplinary program designed for use with art, social studies, history, science, and language arts classes. It can be successfully enjoyed by learners of all ages. It uses hands-on artifacts and challenging activities to help the student learn about the life of George Nakashima. Using the kit, students can experience the textures of the various woods Nakashima used in his work and explore the profound influence that both Japanese culture and woodworking techniques had on his work. 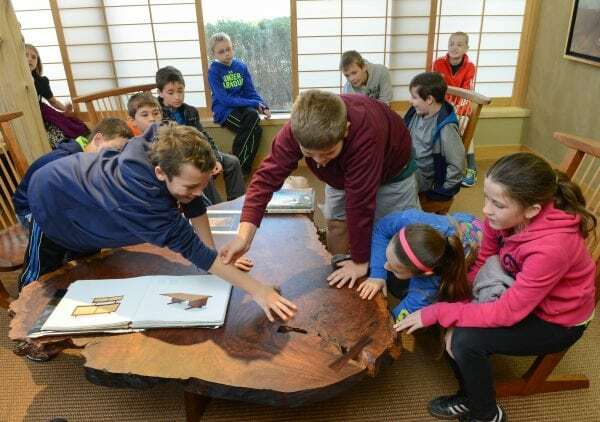 Students can also learn about Nakashima’s connection to the Arts and Crafts Movement in America and the Modernist movement in Europe. Teacher’s manual containing lessons in architecture, modernism, Haiku poetry, Sumi-ink painting, and much more! Support for this project was provided by The Philadelphia Exhibitions Initiative, a program funded by The Pew Charitable Trusts and administered by The University of the Arts, Philadelphia.